1. Put all the marinade ingredients into a large saucepan. Cover and bring to the boil, then simmer for five minutes. 2. 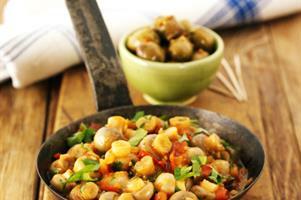 Add mushrooms, tomatoes and olives. Stir well. Cover pan and simmer for three minutes. 3. Remove mushrooms to a serving bowl, and then boil the cooking liquor rapidly until reduced to half quantity. 4. Cool, discard bay leaves. Season to taste, and then pour over the mushrooms. 5. Chill for two hours before serving with pitta bread.